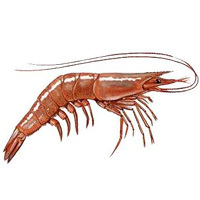 Commercial shrimp extracts have been used in most studies with shrimp. Pharmacia Diagnostics (Uppsala, Sweden) extract Pandalus borealis, Torii Yakuhin (Kobe, Japan) extract a mixture of Penaeus monodon, Penaeus semisulcatus and Metapenaeus affinis while Bencard (Munich, Germany) only specify an extract of cooked shrimp, fit for human consumption (Elizabeth Urban, personal communication). Protocol: (controls, definition of positive etc)The protocol of Arai et al. (1998)  is available in Japanese. Number of Patients:Arai et al. (1998)  tested 3102 adult asthmatic patients with dust mite and cedar pollen allergens and 33 foods. Summary of Results:Arai et al. (1998)  report that 625/3102 patients had a positive skin test for one or more food allergens. 27.7% of the patients with a positive test reacted to shrimp which was the most frequently found allergenic food. Food/Type of allergen:Leung et al (1996)  used recombinant Met e 1 and extracts made by taking approximatively 2 gm of muscle proteins from each of abalone (Haliotis diversicolor), whelk (Hemifusus ternatana), mussel (Perna viridis), pen shell (Pinna atropurpurea), clam (Lutraria philipinarum), cuttlefish (Sepia madokai), squid (Loligo edulis), octopus (Octopus luteus), shrimp (Metapenaeus ensis), mud crab (Scylla serrata), spiny lobster (Panulirus homarus), grasshoppers (Mecopoda elongata), oyster (Crassostrea gigas), and "alaskan scallop" (an unidentified species of the family Pectinidae). The muscle was boiled in deionized distilled water for 10 minutes. The boiled muscle was homogenized with either 100 mmol/L Tris, 10 mmol/L ehtylenediaminetetraacetic acid, 10 mmol/L 2-mercaptoethanol or phosphate-buffered saline (PBS) in a Polytron homogenizer (Brinkman) for 30 seconds and centrifuged at 14,000 rpm for 10 minutes. The supernatant was aliquoted and stored in -70° C. Cockroach (Periplaneta americana) and fruit fly (Drosophila melanogaster) were also extracted but as whole body extracts. Leung et al (1994)  used sera from 8 shrimp allergic patients and 12 atopic controls. Leung et al (1996)  used sera from 9 shrimp allergic patients. Immunoblotting separation:Leung et al (1994)  and Leung et al (1996)  separated the extracts by SDS-PAGE in a 10% separating gel with a 5% stacking gel. Samples were boiled for 10 minutes in buffer with 4% SDS, 10% 2-mercaptoethanol before loading. Immunoblotting detection method:Leung et al (1994)  and Leung et al (1996)  electrophoretically transferred proteins onto a nitrocellulose filter in a semi-dry transfer cell (Bio-Rad) at 15 V for 1 hour. Strips of the blot were blocked with 3% (w/v) nonfat dried milk in PBS for 30 minutes. Strips were incubated in the test serum (1:10 dilution) in PBS with 3% milk at 4°C overnight with shaking. The strip was washed in PBS-Tween (0.05% Tween-20 in PBS) at room temperature three times for 20 minutes each. The bound IgE on the strip was detected by incubation with 125I-labeled anti-human IgE (Sanofi-Pasteur Diagnostics, Ohaska, Minn.) in PBS buffer with 3% milk at 4°C overnight. Nonspecific binding was removed by washing the strip with PBS-Tween at room temperature three times for 20 minutes. The strips were exposed to x-ray film with an intensifying screen from 24 hours to 1 week at -70°C. Leung et al (1994)  used immunoblotting to detect clones producing recombinant Met e 1. Leung et al (1996)  chose 9 sera which bound Met e 1 at 38 kDa. The 38 kDa band was found with 9/9 sera in the extracts of shrimp (Metapenaeus ensis), mud crab (Scylla serrata), spiny lobster (Panulirus homarus), grasshoppers (Mecopoda elongata), cockroach (Periplaneta americana), fruit fly (Drosophila melanogaster), abalone (Haliotis diversicolor), whelk (Hemifusus ternatana), mussel (Perna viridis), pen shell (Pinna atropurpurea), scallop, oyster (Crassostrea gigas), clam (Lutraria philipinarum), cuttlefish (Sepia madokai), squid (Loligo edulis), and octopus (Octopus luteus) but not with chicken or mouse. A 49 kDa band was seen with 8/9 sera with whelk (Hemifusus ternatana), with 7/9 sera with squid (Loligo edulis), with 4/9 sera with pen shell (Pinna atropurpurea) and with 2/9 sera with oyster (Crassostrea gigas). Pen shell, scallop, oyster, squid, and octopus also bound IgE from a single serum at 68-72 kDa. This serum also bound a 28 kDa band from octapus. Preabsorption of the tested sera with the recombinant shrimp tropomyosin, Met e 1, resulted in complete inhibition of their IgE reactivity to the 38 kDa protein present in all the tested mollusks. Oral provocation is described for white shrimps (Litopenaeus setiferus) (Daul et al. 1988) . Blind:Not described for Metapenaeus ensis. Number of Patients:Not described for Metapenaeus ensis. Dose response:Not described for Metapenaeus ensis. Symptoms:Not described for Metapenaeus ensis. Leung PS, Chu KH, Chow WK, Ansari A, Bandea CI, Kwan HS, Nagy SM, Gershwin ME. Cloning, expression, and primary structure of Metapenaeus ensis tropomyosin, the major heat-stable shrimp allergen. Experimental Masses:34 - 38 kDa (by SDS-PAGE). Tropomyosins run near 50 kDa with 6M urea. No data available for Met e 1. However, Ayuso et al. (2002)  used 46 overlapping synthetic 15 amino acid peptides with sera from 18 shrimp-allergic subjects to identify the IgE-binding regions of Pen a 1, the tropomyosin from Farfantepenaeus aztecus. 5 major IgE-binding regions were identified as residues 43-57, 85-105, 133-148, 187-202 and 247-284. In addition, 22 peptides as minor IgE-binding regions were identified. Similarly, Shanti et al. (1993)  digested Pen i 1 with trypsin and identified two peptides corresponding to residues approximately 153-160 and 50-66 as epitopes. Shimakura et al. (2005)  report that partially proteolytically digested shrimp tropomyosin can bind IgE from sera of allergic patients when tested by ELISA inhibition rather than immunoblotting or ELISA. Similarly Reese et al. (1996)  report that Pen a 1 cleaved by CNBr or digested by endoproteinases Lys-C, Glu-C, trypsin, Arg-C or chymotrypsin continued to bind IgE from allergic sera. Naqpal et al 1989  describe a naturally occuring 8 kDa allergen from Fenneropenaeus indicus which corresponded to a proteolytic fragment of the tropomyosin. Fu et al. (2002)  showed that shrimp tropomyosin (probably Pen a 1) was rapidly degraded by simulated gastric fluid. Allergenicity can survive cooking, possibly because tropomyosin have a very simple helical structure which can rapidly refold after denaturation. Extracts from boiled shrimp are frequently used in allergen purification and for extract preparation. Reese et al. (1997)  determined the sequence of Pen a 1, the tropomyosin from Farfantepenaeus aztecus. They showed that the 30 DNA substitutions only resulted in a single amino acid substitution. The tryptic peptides reported by Shanti et al. (1993)  from Fenneropenaeus indicus included 4 amino acid substitutions in 150 residues. Thus penaeoid shrimp tropomysins are likely to be immunologically almost identical. DeWitt et al. (2004)  report that the level of sequence identity of tropomyosins with Pen a 1 is 99% for lobster (Homarus americanus), 92% for crab (Charybdis feriatus), 78-82% for insects and dust mites, 71% for a nematode (Caenorhabditis elegans) and 57% for both blue muscle (Mytilus edulis) and human, suggesting that IgE cross-reactivity is very likely for the invertebrate tropomysosins. Leung et al (1998)  had earlier reported similar levels of amino acid identity for crab Cha f 1, Met e 1, lobster Pan s 1 and Hom a 1 and Homarus americanus slow muscle, fruit fly and chicken tropomyosins. DeWitt et al. (2004)  also showed specific IgE binding to recombinant Pen a 1 and seven invertebrate extracts with 9 sera. 6 sera bound extracts from crustacea most strongly, 2 bound dust mite extract more strongly and one serum showed similar binding with both extracts. rPen a 1 bound 94% of the IgE from the 6 crustacea specific sera and gave 50% inhibition of the binding of extracts at about 0.1 µg/ml. Ayuso et al. (2002)  investigated the binding of IgE to the sequences from other invertebrates related to the epitopes identified by Ayuso et al. (2002) . The epitope sequences were >90% identical between crustaceans, mites and cockroach. These epitopes were also reported to be related to those found in Pen i 1 from Fenneropenaeus indicus (Shanti et al. 1993 ). However, the epitopes identified from oyster (Ishiwara et al. 1998 ) and horned turban (Ishiwara et al. 1998 ) were different. Ayuso et al. (2002)  suggest that, in general, 2 amino acid substitutions in an epitope removes IgE binding. Leung et al (1996)  used sera from 9 shrimp allergic patients and tested for cross-reactivity on immunoblots. As well as all arthropods (crustacea and insects), IgE binding was seen with all 9 sera to tropomyosins from gastropods: abalone (Haliotis diveriscolor) and whelk (Hemifusus ternatana), bivalves: mussel (Perna viridis), pen shell (Pinna atropupurea), scallop, oyster (Crassostrea gigas) and clam (Lutraria philipinarum) and cephalopods: cuttlefish (Sepia madokai), squid (Loligo edulis) and octopus ((Octopus luteus). None of the sera bound to either chicken or mouse tropomyosin. Reese et al. (1996)  also reported that porcine, bovine and rabbit tropomyosins did not bind IgE. Leung et al (1998)  demonstrated that allergy to both spiny lobster and American lobster (Panulirus stimpsoni and Homarus americanus) was due to tropomyosins and that preincubation of sera with the recombinant shrimp tropomyosin Met e 1 removed their IgE reactivity to lobster muscle extracts. As allergy to crustacea is dominated by reactions to the tropomysosins, clinical data on cross-reactivity and studies on IgE binding to extracts is also informative. Fernandez et al. (2003)  demonstrated IgE binding and SPT reactivity in subjects sensitised by insect and mite allergens without prior exposure to shrimp. In contrast to the extensive observed cross-reactivity in IgE binding, clinical cross-reactivity is less common and some but not all crustacea allergics can tolerate mollusks (Leung et al (1996) ; Ishiwara et al. 1998 ; Ishiwara et al. 1998 ). Leung et al (1998)  report the production of recombinant Met e 1. Naqpal et al (1989)  purified two heat-stable allergens, designated as Sa-I and Sa-II, from boiled shrimp (Fenneropenaeus indicus) extracts. Sa-I was isolated by ultrafiltration, Sephadex G-25, and diethylaminoethyl-Sephacel chromatography and gave a single band on SDS-PAGE at 8.2 kDa. Sa-II was purified by successive chromatography on diethylaminoethyl-Sephacel, Bio-Gel P-200, and Sepharose 4B columns. It gave a singe band at 34 kDa on SDS-PAGE. Shanti et al. (1993)  showed that Sa-II was a tropomysosin and Sa-I a fragment of Sa-II. Reese G, Jeoung BJ, Daul CB, Lehrer SB. Characterization of recombinant shrimp allergen Pen a 1 (tropomyosin). Shimakura K, Tonomura Y, Hamada Y, Nagashima Y, Shiomi K.
Fu TJ, Abbott UR, Hatzos C.
Digestibility of food allergens and nonallergenic proteins in simulated gastric fluid and simulated intestinal fluid-a comparative study.